The Sony FE 100mm F2.8 STF GM OSS is a short-telephoto prime for Sony full-frame mirrorless E-mount cameras such as the high-end a9 and the earlier A7 models. Besides being a G-Master model with high-grade optics and build, it has number of interesting features that make it stand out as a highly specialized lens for portraiture. First is the inclusion of optical image stabilization, which can be used to complement the camera’s sensor-shift stabilization (where applicable); and second is the use of an apodization filter or APD element as part of the optical construction. The Sony FE 85mm F1.8 is a high-speed standard prime for Sony full-frame E-mount cameras such as the A9 and A7 cameras, but will also fit smaller “cropped” sensor APS-C models such as the A5000, on which it offers an equivalent field of view of a 130mm focal length. Carl Zeiss’s latest range of Batis lenses have been specifically designed for the Sony A7 series of full-frame mirrorless cameras such as the Sony A7R II and Sony A7S II. Together with the legendary optical precision and outstanding build quality for which Carl Zeiss lenses are known, the new Batis lenses also feature autofocus and an innovative OLED display on the lens barrel that gives both focus distance and depth-of-field information. The first lenses released in the Zeiss Batis lineup are the 25mm f/2 wide-angle prime and the 85mm f/1.8 short telephoto prime. Rather than follow established trends for high-grade, high-speed lenses that are inevitably large, heavy, and cumbersome, the manual-focus Loxia series from Zeiss, like the AF Batis range, feature the same high-grade optics, but with more modest maximum apertures in a form factor based on the premise of the tiny size of the Sony A7 full-frame mirrorless cameras themselves. Announced in October, 2015, the $1499 Zeiss Loxia 21mm f2.8 is a super-wide-angle prime with a new Distagon design that’s been optimized for the demands of digital capture. 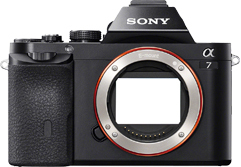 The new Sony A7S II is the upgrade to the A7S and offers ultra-high sensitivity up to ISO409600 and 5-axis stabilization in what promises to be an impressive available-light camera. In addition, the A7S II builds on its predecessor’s video credentials, adding 4K (UHD) internal and Full HD video up to 120 fps. Read on to find out how well the sensor in this new model performs. Packing a 28.2Mp APS-C sensor, 4K-video and 15fps burst shooting, the new Samsung NX1 is hot news on the hybrid scene. For a full overview of features and specifications, check out our NX1 Preview. And now with the NX1’s sensor measurements in and verified, let’s see what Samsung’s latest NX hybrid camera has to offer.